I have been on a huge cinnamon kick lately and I don't usually over think these things, but I wonder if this craving means anything in particular. Is my diet lacking in some way? Perhaps I'm just missing the warmth of the holiday season and the tastes that go with it? Or maybe I'm feeling cold because of all this snow we've been getting and cinnamon is just my way of getting a little warmth and comfort? In any case, I decided to give in to the craving because cinnamon, it seems, has many health benefits. There is of course all this debate of true cinnamon vs Cassia. Having never tried true cinnamon (also called Ceylon cinnamon) before a few weeks ago, I had never given it much thought. But after a trip to my local health food store, I came back home with a small packet of true cinnamon and I was really surprised at how much different it was from the cinnamon I had always used. 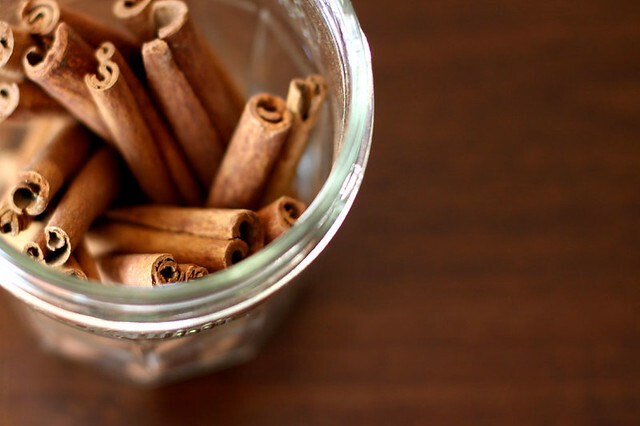 True cinnamon has a lighter color and is much more subtle in flavor than Cassia. Less spicy, I would say. I've found though that I have to use more of it in baked goods to get that expected cinnamon-y kick. I think true cinnamon would be better for sprinkling over oatmeal after cooking or in a recipe where a subdued spiciness is preferable. I'm thinking rice pudding or maybe warmed milk. I guess I am craving comfort! What are you craving lately? I used true cinnamon in this recipe so I used 2 teaspoons of it. If you use Cassia and you're not a cinnamon fanatic, reduce it to 1 teaspoon. You can also adapt this recipe by incorporating dried cranberries instead of raisins, adding nuts or other seeds, even chocolate chips if you feel like it! Preheat oven to 400 F. Grease a muffin tin or line with paper muffin cups. In a bowl, soak oats in buttermilk for 15 minutes. Stir in eggs, sugar, oil, applesauce and vanilla extract. In another bowl, combine flours, ground flax seeds, cinnamon, baking powder, baking soda and salt; stir into oat mixture just until moistened. Fold in raisins. Fill prepared muffin tin three-fourths full. Bake in preheated oven for 18-20 minutes or until muffins test done. Cool in pan 5 minutes before removing to a wire rack. * Sometimes, when I don't have buttermilk, I use 1/2 cup of milk mixed with 1 cup of low-fat sour cream or yogurt. Other times, when I don't have buttermilk, sour cream or yogurt, I mix in 1 tbsp of lemon juice with 1 1/2 cups of milk and let it rest for 5 minutes before adding it to the recipe. I had no idea "cinnamon" wasn't actually true cinnamon - so interesting! The muffins sound delicious... my kind of baked good =). These look and sound amazing. 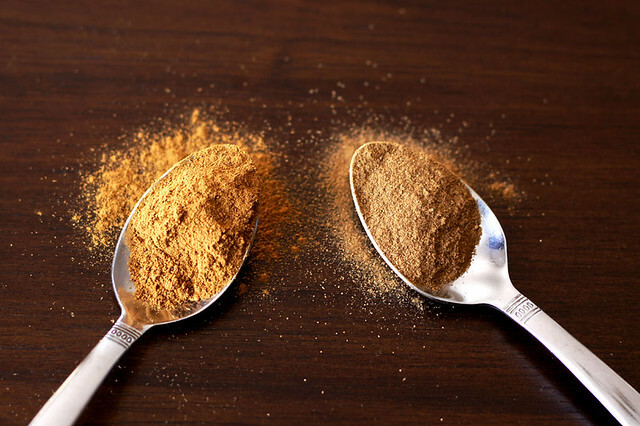 My sis and I love our cinnamon as well and post many health benefits on our blog but we have never tried "true" cinnamon. Now I am on the hunt. Cheers! My daughter will LOVE these and it will be a great trick to get her to eat raisins! I agree that the dishes I usually think of as cinnamon-y are better with cassia. One I really like with ceylon is the espresso walnut recipe on epicurious. I am not much of a muffin fan, but I think this would work well as cake as well. Cinnamon is great all year round! Funny how we probably adapted to the taste of cassia. I recently bought Vietnamese Cinnamon... It all comes down to what you like. But old-fashion cinnamon flavor is an absolute favorite! 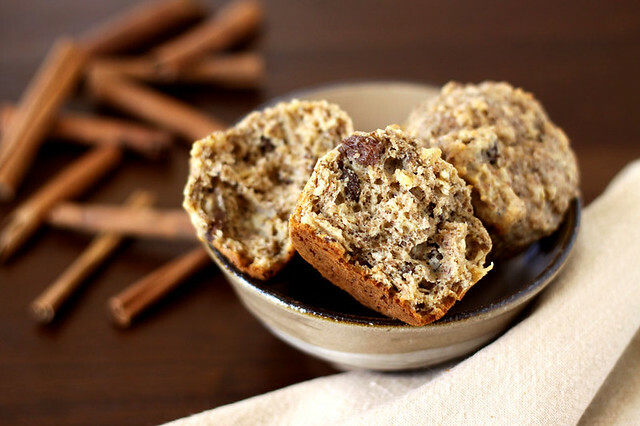 This is my kind of muffin, full of flavor but with some healthy ingredients!